A short turn-based game about building a sustainable colony on Mars, created for NASA's Dark Side of the Jam, a 48 hour game jam. It boils down to resource management, and determining the best place to build things. Use the mouse or touch on tiles on the map, and use the buttons to either scan or build. Scanning checks the ground for resources. Multiple scans can be made in a turn, but building costs a turn. 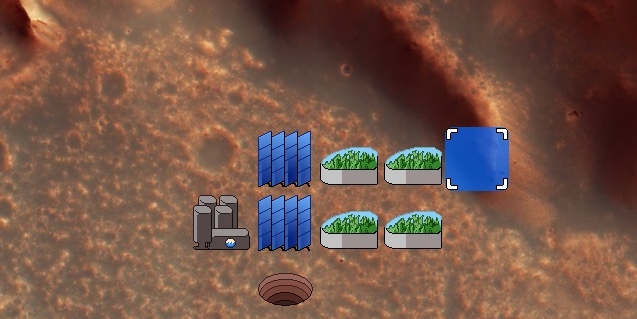 This prototype is just the initial building stage, so you have 10 turns to build enough structures to maintain power and sustain food and water. By the end of the final turn, your resources must all be in the positive range.